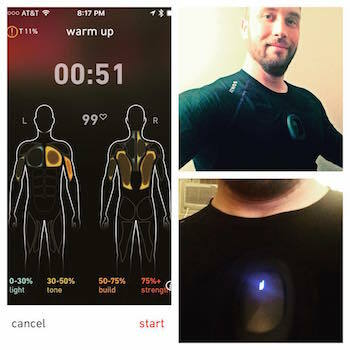 For me, tracking data related to my overall health & fitness has been a long and amazing journey; starting off almost a decade ago in 2009 with my Total Recall post (http://eric-blue.com/2009/10/18/total-recall/), my idea on fitness tracking after waking up from a dream (http://eric-blue.com/2010/08/14/fitness-tracking-platform-personal-informatics-for-fitness/) and ultimately building a health & fitness data aggregation company – ActiveOS – http://activeos.com. I’ve written every few years and given an update on my current tools, areas of focus, and discoveries I’ve made since I’ve been immersed in Quantified Self. Where I am today (2019) will be the focus of a more in depth future post, but for now I wanted to publish a snapshot of knowledge I shared back in 2015 on Quora (my areas of focus and discoveries are still very much in alignment since I originally authored that piece). I’ll try not to write a novel here. But, some background context is helpful. It’s been about 5 years since I immersed myself deeply into the Quantified Self movement. I jumped in head first starting in 2010 and since have been very active in the community, global conferences, and helped start the Los Angeles QS Meetup group. But, my entry into Quantified Self and eventually re-igniting my passion for health & fitness was an accident. Since it all began I’ve learned quite a bit. For many now, “Quantified Self” has become somewhat of a buzzword and is sometimes perceived as being synonymous with the wearables movement (tons of apps and sensors tracking virtually every aspect of your life). It is that, but much more. In terms of the genesis of QS and my experience with it, it started off as a very personal quest. In 2010 I was very interested in knowledge management, learning, life logging and leaning very much towards introspective self-tracking (more knowledge, less action). I was also in the worst physical shape of my life, and suffering from some serious back pain and flareups that was from an injury many years before. Overweight and frustrated at the time, I first heard about Fitbit and bought it out of shear curiosity and had the idea that I would get a better understanding of my activity patterns and start building some better activity habits (morning walks, going to the gym more, getting up from the desk and moving more often, etc) so I could pull myself out of the seemingly never-ending injury cycle. This started my shift of focus towards improving my health and ultimately tracking many areas of my life (sleep, nutrition, stress levels/mood, location, etc). Much has happened in the 5 years since. 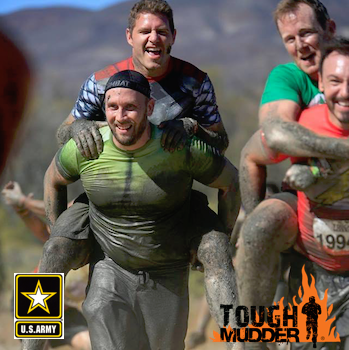 I’m now in the best shape of my life, my recurring back issues have been kept at bay (just a couple issues in the past 3 years), and I’m now training for a Tough Mudder in Oct (a 12 mile run and intense obstacle course that is grueling to say the least); something I never would have thought possible 5 years ago. You could argue that all of this could have been possible with out a Quantified Self mindset/paradigm or the multitude of fitness sensors and apps. But, I view all of these as support system that allows you to raise awareness of what’s going on in your life and to eventually help build healthy habits so actions become second nature. What do I actually track? It’s hard to compress 5 years of “in the QS trenches” into a top 10, but I’ll do my best. Actually, I tend to think of this all in terms of what I’ve learned from the QS process (how I approach self-tracking) and the individual areas of my own life that I’ve improved. I’m much more active in terms of general activity than I was before tracking – Now, you’re probably thinking how could I know how active I was before wearing some sort of pedometer like Fitbit. Great question. If I had to guess, over a period of a few years I was probably averaging between 3,000 – 4,000 steps per day (now that I have years of data I know what an average ‘work day’ activity pattern looks like). Like many, being a knowledge worker and desk bound most of the day you spend time tied to a desk and slouched over in the ‘praying mantis position’ at the keyboard. Since tracking my general activity, I go in cycles by try to aim for at least 8,000 – 10,000 steps per day. I’m a sleep mutant and use it to my advantage – Since tracking my sleep for over a year using the Zeo (now defunct, but a great product which was a single-channel EEG that measured brain activity while you sleep). I actually discovered that I get between 25-33% more REM and Deep sleep than the average person EVEN with sleeping less hours. So roughly speaking if I get 6-7 hours of sleep I’m getting as much quality sleep than somebody who sleeps 8 or more. I spent some time trying to find the underlying cause, even switched out the Zeo and used different headbands and saw the same result. It’s still a mystery, but I’m not complaining. I generally wake on my own, feel well rested and am probably in the 90+th percentile in terms of great sleepers. I’ll take it. I still struggle with diet and food, but have found tracking my food to be beneficial. Food is my weakness. I LOVE to eat. I always say that if I didn’t workout so much and pay attention to what I eat, I’d easily be *a lot* bulkier. Tracking all the meals you eat sounds painful and annoying. Honestly, it can be sometimes. I used to go in cycles where I would track my calories/macronutrients for 4-8 weeks at a time and give up. I’m now going on doing this for a year straight and have a much better understanding of my eating patterns and what types of foods I eat that better fuels my performance. Having tried many styles of diet (zone, paleo, low carb, intermittent fasting) and sometimes having an unhealthy focus on not eating enough (staying in a calorie deficit for way too long) I am now eating properly and in a way that fuels my performance. I’ll more than likely stop doing this at some point and build strong habits so what I eat becomes second nature. But, this process has been eye opening in terms of what I eat and how it impacts my sleep, stress and general performance. Heart Rate Variability is both intriguing and very beneficial. I won’t go into the details on HRV, but in a nutshell is a somewhat well studied measure of stress (physical+emotional) and higher HRV generally = good. I’ve tracked HRV now for a couple years on a daily basis and use this as a tool to see how my nutrition (bad diet or even alcohol can effect HRV), sleep and workload impact my HRV. Generally even a 5-20 point dip from one day to the next really is indicative if I feel sluggish or drained. Heavy strength training and in particular deadlifts are taxing on your central nervous system, and even activities like HIIT, sprints and races have an impact. 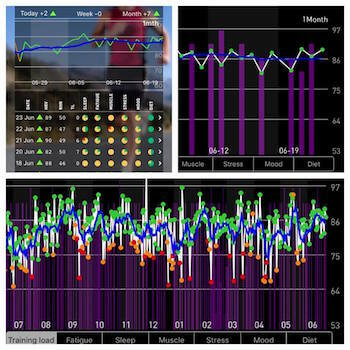 I generally use my HRV score to gauge how I approach workouts – I sometimes tend not to hold back or skip workouts, but if my HRV is low I’ll proceed with caution. 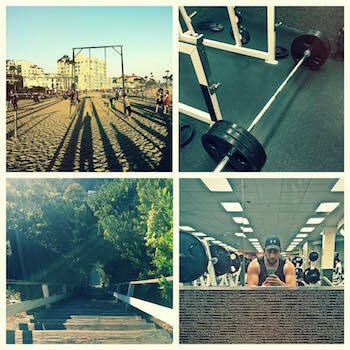 I have a more balanced approach to my fitness training – After a lot of research into various workout and training regimens and trying to understand why I kept having years of back flareups I took an analytical approach to my training. It sounds simple but I had *major* imbalances between my upper and lower body. I was always generally strong with upper body – bench pressing and push-ups. Until I took a closer look I didn’t realize how bad it was. I was ~ in the 80-85th percentile in terms of upper body strength and barely in the 40th percentile for lower body (squat and deadlift capability). Coupled with weak areas like tight hips and low glute activation, this was a recipe for major recurring disaster with my training. Fast forward 5 years and my upper body strength has just improved slightly (no major need to drastically change there), but my lower body has improved to where I’m now at least in the 60-70th percentile in terms of strength standards. In the past year I’ve also taken a very holistic approach to my training and have incorporated quite a bit of cardio and HIIT along with my strength training. I’m a huge fan of the concept of concurrent training or being a ‘hybrid athlete’ – the best of both worlds; finding a balance between being strong and well conditioned. I have a somewhat uncanny memory that I never realized I had before and it’s improved with practice – after spending time working on my travel journal, collecting photos from a 15 year period and writing down all of the places I’ve been, I realized I have a knack for recalling dates and times. My memories seem very much anchored around this and I can quickly recall dates, places, conversations. Ask me a date and I can often surprise or annoy with the detail. I think the act of creating the travel journal for the 10-15 year period actually significantly strengthened this ability and made my memories even more crystal clear. I never have to worry about remembering where I’ve been or traveling – This almost sounds like the exact opposite of #6. I actually got into automatic geolocation tracking as a result of not wanting to have to write everything down immediately after I went on a trip. I figured I could automatically collect data in real-time with little to no effort and analyze at a later date when it was convenient. I was inspired by Gordon Bell from his book ‘Total Recall’. He carried around a small high-precision GPS sensor that tracked his latitude/longitude every 5 seconds. I took a similar approach and bough a dedicated device (QStarz GPS) and carried it around with me for 4 years. Since then I’ve been able to write software to analyze all of the places I’ve been (restaurants, trips, average speed in traffic, etc) and have found some interesting patterns. Keeping track of your ‘personal bests’ helps immensely. This is more of a fitness thing than Quantified Self approach. But in a 5 year period I moved from being in a sedentary and very unfit state to now operating at a fairly high level in terms of strength and activity. I started off with just tracking my morning walks and didn’t want to ‘break the streak’. Once I started feeling better (great actually from walking) I started picking up a better habit of going to the gym. 2 days a week turned to 3 and eventually turned into 5 or 6. 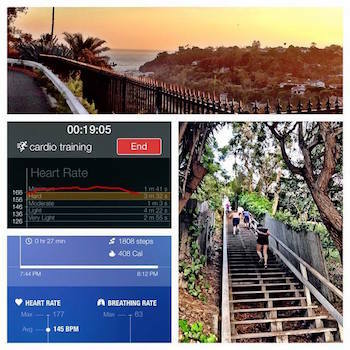 I tracked my max # of pushups to 5K running times, bench press and deadlift records and now tracking my workout pace doing intense weekend workouts on the Santa Monica stairs. I’ve learned to keep pushing myself little by little, gradually over time and look to keep improving and beating my own records. Data is meaningless without comprehension and action. 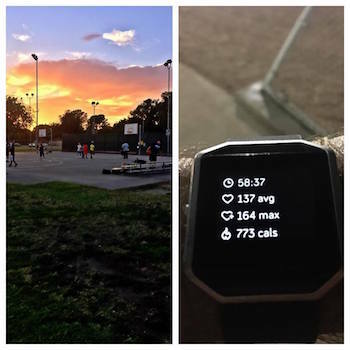 This is coming from a self-professed technology and data geek who owns virtually every health & fitness tracking sensor out there and is building a business and platform in the space for doing health & fitness data aggregation & analytics. Data and awareness of what’s going on is the 1st step in understanding. Many people don’t always make the leap from being in data collect mode towards a ‘Now what can I do with this data and information?’ mindset. Technology will help with this (finding the signal in the noise, finding the needle in the haystack, etc.). But, at the end of the day data will not do the hard work for you. You need to get up and move, build healthy habits and take massive action every day. The takeaway and issues? This is something that will be different for each individual. But, my advice would be to be curious, start small with what you’re interested in improving in your life. 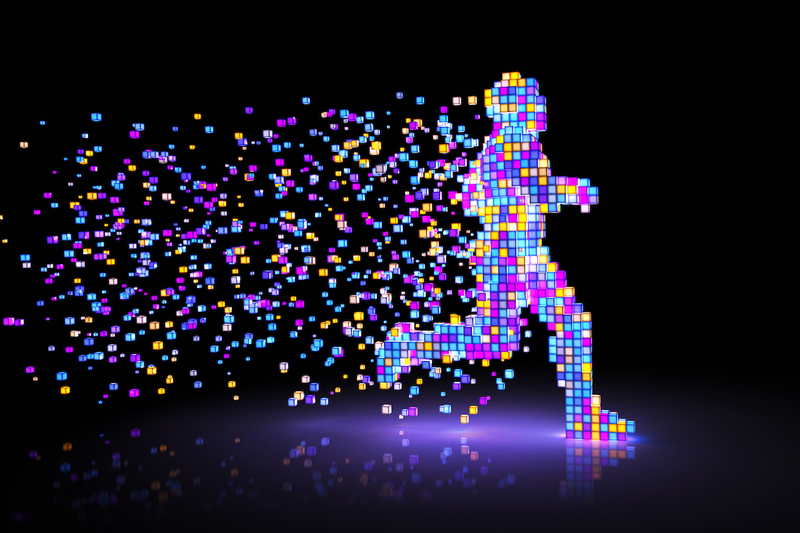 Find ways to collect data (using sensors, wearables or apps) that are painless and ‘just work’. Keep collecting, but also always keep action in mind.